By Daniel Koren--For close to a quarter of a century, the annual pilgrimage known as the March of the Living has been providing teenagers and adults from across the globe the chance to witness – and take part in – history, firsthand. In Toronto, which supplies the largest delegation of March of the Living participants outside of Israel, the event is funded through donations made to United Jewish Appeal’s Annual Campaign. Every April, thousands of Jews and non-Jews alike travel to Poland to view the once flourishing Jewish community before visiting former concentration camps and ghettos, and then arriving in Israel in time to celebrate Yom Ha’atzmaut – Independence Day. At the height of the experience, the diverse group of participants gather together and embark in silent march, travelling the three kilometres that separate Auschwitz from Birkenau. Though the trip can be an emotional journey, anyone who has ever taken part will confirm that it is also utterly life-changing and necessary. Next year’s March will be Polish-born survivor Mania Hudy’s third. As difficult as it’s been for her to return to Poland, she is grateful to help enlighten others through the tales of her experiences. Students like March of the Living Alumni Josh Wine confirm the influence the March has on its participants. “We were constantly reminded that the survivor generation is ageing and will not be around forever,” said Wine.”I had the sense that it was extremely important not just to listen to the survivor's stories, but to save them in memory; it will be our duty in the future to caution younger generations of the great tragedy that was the Holocaust, by retelling survivors' stories.” The March of the Living is open to Jewish students in grades 11 and 12. 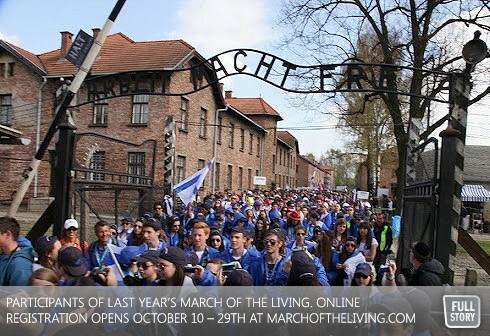 Online registration opens October 10 – 29th, at www.marchoftheliving.org. Information meetings are scheduled for October 4th and 18th at the Beth Emeth Synagogue at 7p.m. Young Adult and Adult Missions are available as well. For more information, contact Sherri Rotstein at 416.398.6931 ext. 5359 or via email at srotstein@ujafed.org.